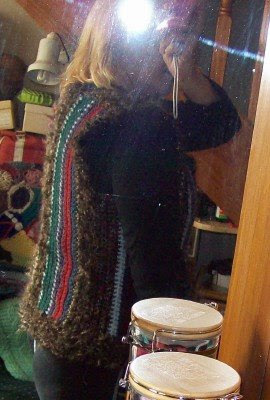 I made this vest from lots of scrap yarn that I had and the trimming is made from a yarn I was given by Stramenda from the crochet lovers group on ravelry. 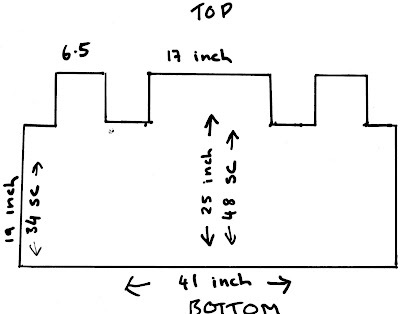 Firstly I had to come up with some sort of plan to go by, so I drew one up, but I did alter it as I went along and below is the final plan I used for my vest. It is made in one complete piece. 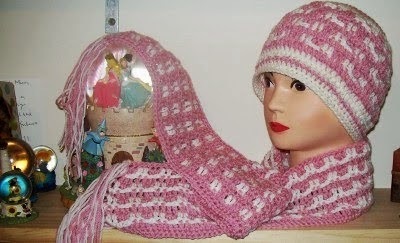 Here you can see how it has come along, I crocheted it so the stripes were vertical. 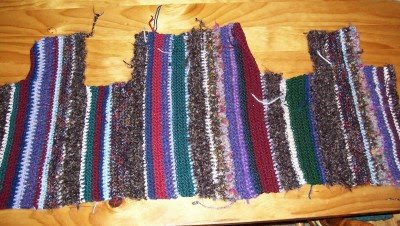 Following this stage, I sewed the front shoulder parts to the back, sewed in all the loose ends and used the same yarn to crochet around the vest for a nice edging. No body was home to help me take pictures. So here I am modeling my new vest. The big bold leather buttons really make a statement. They were a part of my dear departed mother in laws button stash, I'm so glad I got to use them, we think they may have been of one of my dear departed father in laws jackets. 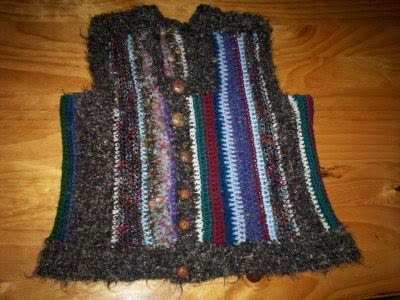 Not wanting the front of the vest to sag or gape when buttoned, I actually sewed the front of the vest together, over lapping one side under the other and it fits very well over my head and hangs nicely to my shape. The moral here is, keep those scraps you have, there is always something to be made from them.